The Proverbs 31 Woman! The Virtuous Woman!! The Perfect Wife!!! “Every” Christian woman if I may say has at one point or the other dreamt of being a virtuous woman. Some have been tagged Virtuous women and some call themselves so too. OKAY, ME TOO!!! In fact, I dreamt of it, prayed to be one and even worked towards being one but despite all these, I AM NOT ONE. So before you label me a Virtuous woman, hear me out and you too before you say what you should not say, read till the end. More than Rubies and Diamonds were used to define the quality of this woman. These are hard minerals. Listed among the natural gems, their hardness are in the ranges of 9.0 and 10 respectively. Wow!!! These are very expensive minerals indeed. They can withstand every painful treatment and enhancement. Hmmm, can I bear such heat without complaining or even saying “issshhh”? King Solomon goes on to describe this woman from verses 11-29 and I am dazed at the detailed description. Well bringing it back home; looking at myself in the mirror I asked myself from each verse if I meet up to it and oh my, truthfully and sincerely from the depth of my heart, I am so very very far from meeting up. Didn’t this woman have off days? She works so late and wakes up early. I would have fallen sick from exhaustion and stress. She doesn’t worry during cold season because every one is prepared well for it. How many times have rain beaten my husband and I because I didn’t remember to put Umbrella in the car? When she buys a land, she plants a vineyard. Me that hate earthworms, how will I survive running a garden not to talk of a vineyard? She is strong and able to do all her work. Hmmm, My husband helps me oooo. In fact, there are somethings, he wont allow me do because I don’t have the strength to do it. What? She is a seamstress, a business woman, a cook, a gardener, a landlady, a helper, an accountant, a teacher, a home maker, and so on and she is serving all these duties FULL TIME. Huh??!!! God help me. I’m sorry, that’s all I can say. So she didn’t ask for help? Not me. I can ask for help for Africa. Especially from my husband. Did she ever sit down with her husband to watch TV or gist? Hmmm my husband is my gist partner, my watching TV partner, my shopping partner, my cooking partner and my driving partner. Our partnership has got no part 2. Then coming to verses 30-31, King Solomon must have realised that all he described was an angel and angels do not marry (Matthew 22:23-30) – My dad’s message to US. Hence ending that chapter so. The woman described above was a perfect one but here I am, I still get angry and I have days when I am very very lazy. I have days when my husband is awake late to see that I am okay. He still does my smoothies and helps pack my bag sometimes. King Solomon concluded that chapter by telling us about the Woman who fears the Lord and he advised that she be praised. She should be credited for whatever she does and that publicly – not necessarily with a megaphone or in a public place but open your mouth and tell her genuinely. Don’t just say it in your heart. Now I wonder how many work I have done and I am praised publicly? I pass through my husband’s office to drop his lunch and I am praised. I take care of the home and I am praised. I prepare meals and I am praised. The list goes on. I am far from being the perfect wife but you know what? God has helped me to grow over the years and thanks Honey for praising me publicly despite my short comings. Thank you for weighing me and finding so much good in me to outweigh the bad. I can’t promise I wouldn’t ask for your help because I will definitely ask. I can’t promise you that I won’t disagree with you sometimes, I will most likely and I know we will both come to a place of understanding and learning and move forward with God’s help and I am confident we won’t make any mistake. Finally, I know we all have our own definition of who and what the qualities are of the virtuous woman but my manual is the Holy Bible and based on this, I AM NOT ONE, I may have some of the qualities but not all and hence can not brag I am one. After all one does not brag of being a graduate when he/she has some more courses to do. Anyways, please if you see one or know one that is as described in Proverbs 31, I want to meet her. I have a lot of questions to ask too. 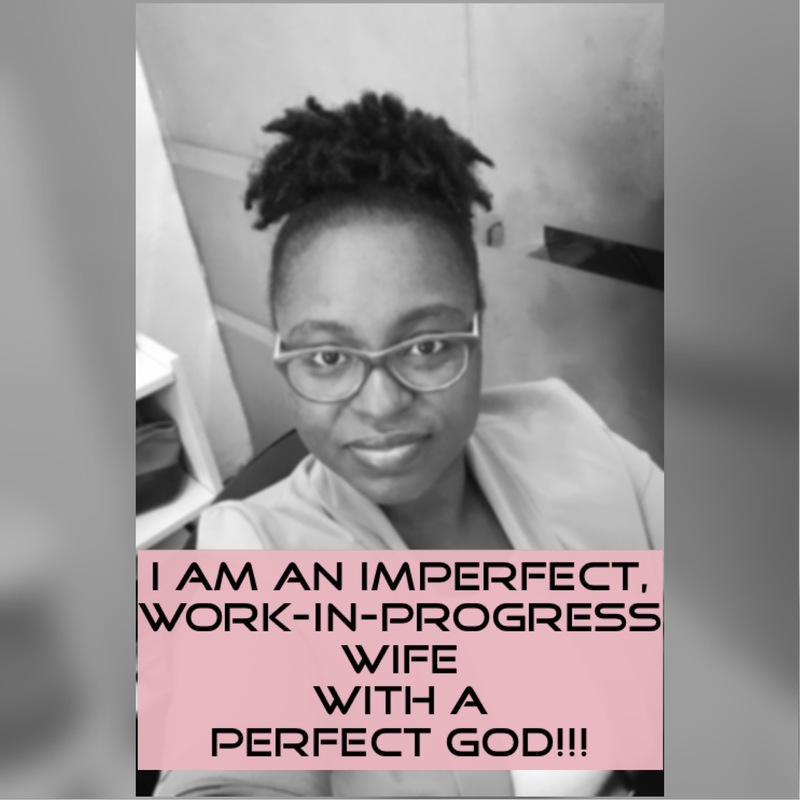 Until we get to heaven and ask King Solomon if Mrs Proverbs 31 ever existed, I remain your imperfect wife, a work-in-progress wife who is redeemed, saved and kept by a PERFECT GOD. Walking with him and having him as our Captain and Shepherd for all eternity. Next Am I Shadow of Myself? Exactly, we will. Thank God. Amen. Well done BlArticles. I can’t agree more. We all are certainly a WIP. May His Grace be fully sufficient for us. Amen. Thanks so much ma. Amen!!! Thank you so much and God bless you ma. God bless you for this. I am far from these description of the proverb 31 woman above but I am getting better by the day. Amen!!! That’s it Sis… acceptance is it and God will definitely help us grow better as the year go by. Hmmmm… God help us all, that we do not disappoint Him from being who He wants us to be in our homes. Amen. Amen. Thank you so much for reading. God bless you. Interesting read! I agree with you on every aspect except this: “… I AM NOT ONE. So before you label me a Virtuous woman, hear me out and you too before you say what you should not say,…” Yes, I am a work in progress; I make mistakes; but I also have the Spirit of God residing in me and manifesting through His fruit (virtue) Gal. 5: 22. Also, I choose to see myself as God sees me, not in my imperfect state. In Rom. 4:17, God calls those things that be not as though they were. Psalm 139:14: I will praise thee; for I am fearfully and wonderfully made: marvellous are thy works; and that my soul knoweth right well. And so I AM A VIRTUOUS WOMAN! And It’s absolutely okay to disagree. And from my walk with God, God has brought me to an understanding that I am not perfect. I will be perfected in heaven. If everyone walks the face of this earth as a perfect one, it means we are all angels. Then there would be no sin and all that. This post was inspired to let every woman know that it’s okay to have flaws. When I mean flaws I don’t mean sin. It is also to let every young man know that that woman who they’ll take home as their wife have some flaws. She is not an angel. So my dear Sis. I appreciate you but truth be told not by faith this time. I am not one. I am a work in progress. God bless you without notice.